I have been tossing a few blogs around trying feel the compulsion to post one of them, I have a few in the pipeline but didn’t feel any of them set the scene quite right. 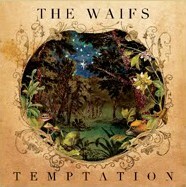 While folding some washing, listening to my favourite Aussie folk band The Waifs, their fabulous new album aptly named – Temptation, I was pulled into the lyrics of the song titled “Somedays”. I believe that it sums up the feeling of Inner Angels & Enemies perfectly. And while I have not personally entered into an actual 12 step program so far in my life, I can relate to addiction and therapy. The lyrics struck chords in my heart so immensely that I felt I needed to share them. I dedicate this song and blog to my Daddy, who I still miss everyday. After years of threatening I have finally done it! Here is the long promised beginnings of my blog. Now I’m sitting here staring at a blank screen wondering what it is exactly that I have been trying to say all these years. Funny how you can’t shut me up when I’m fighting for the floor, but give me an open and public platform, and it renders me at a loss for words, with nothing seemingly important to say. No deep philosophy to express in English today, perhaps gibberish is my new language? My inheritance from my dear departed Dad could be described as somewhat of a deep thinker trait. I do attempt to maintain light conversations however always seem to be pulled to go that step beyond. I have been told I have strong philosophies and perspectives, most of which I feel compelled to share. Insights regarding Human Nature, Faith, Parenting, Mental Health, Spiritual Reality and some of the the Internal Struggles that face many of us who set foot on this planet. I promised my Dad before he died, that I would try and share as much of what he tried to teach me with as many people as possible. His insights completely altered my perspective on every element in my life. I went from being an unaware, emotionally manipulative mess, to being very aware of myself and the mess that usually accompanies me. He also helped me gain the knowledge to clean the mess up and at times even prevent it. Having had life experiences which could be described as phenomenal, life-changing and worth sharing, I find myself wishing to tackle these subjects, to dissect and better understand them, rather than let the world’s natural current drag me along without any resistance. If you find yourself searching for a place where you can go that extra step, I hope you like it here, a place to expand the mind and open the gates to explore unfamiliar territory. Hopefully we can stumble across something mind-blowing together!